A group of international female geoscientists from universities all over the world including NUI Galway, have taken a close look at their profession and discovered the barriers to success, while also pinpointing the sometimes simple changes that can be made to attract more women into innovative industries. The revealing results are published yesterday in Nature Publishing Group’s social sciences journal, Palgrave Communications. The researchers are part of the committee for the international network working for Women in Coastal Geoscience and Engineering (WICGE ), spanning Australia, New Zealand, Ireland, France, the United Kingdom, Mexico and Spain. 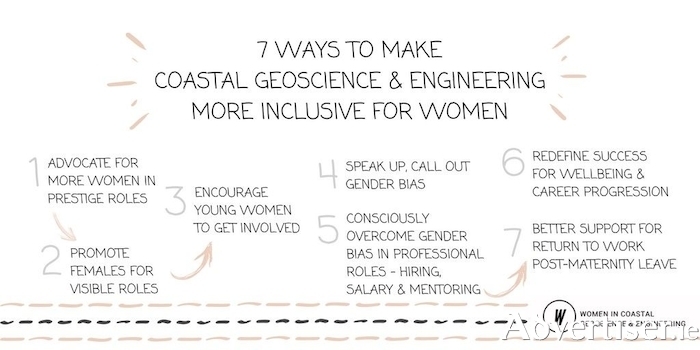 They found that although women make up almost a third of the coastal geoscience and engineering community, they represent only about one in five of its prestige roles. Coastal geoscience and engineering (CGE ) encompasses professionals working on coastal processes, integrating expertise across physics, geomorphology, engineering, planning and management. This study presents novel results of gender inequality and experiences of gender bias in CGE, and proposes practical steps to address it. Women represent 30% of the international coastal geoscience engineering community, yet there is underrepresentation in prestige roles such as journal editorial board members (15% women ) and conference organisers (18% women ). By analysing the views of 314 survey respondents (34% male, 65% female, and 1% other ), the study found that 81% perceive the lack of female role models as a key hurdle for gender equity, and a significantly larger proportion of females (47% ) felt held back in their career due to gender in comparison with males (9% ). Gender stereotyping was amongst the most common manifestation of inequality in coastal geoscience and engineering roles. Stereotyping of women working in Science, Technology, Engineering and Mathematics (STEM ) as not being as competent (or being incompetent ), and not being taken seriously, is a key theme. Microaggressions and harassment - being overlooked and ignored in favour of male colleagues was a key issue, for example, one respondent noted: “Getting my first big grant and employing a male post-doctoral - our project partners treated him as the boss.” While another recalled comments about looks, such as “comments on my ‘pretty face’ being an asset for attracting clients”.